OUR BACKCOUNTRY GOURMANDS SAMPLED THE LATEST GRUB TO FIND THE MOST DELICIOUS MEALS. Some things never seem to change. Like the way a long day on the trail can empty your belly. Or the way lots of freeze-dried fare, however lightweight and easy to prepare, comes up a mile short in the taste department. But here's mouth-watering news: Backpackers suddenly have tons of tempting choices to savor. Knowing how to pick the winners from the losers is the trick. Fortunately, our crew of camp food connoisseurs has done all the taste testing for you. Here are the consensus favorites — all of them new, all of them delicious. Ever notice how tough it is to dig food out of the corners of those tall, eat-in-the-bag pouches? Try this: After rehydrating the meal, cut off the top 2 or 3 inches of the pouch. Unbeatable real egg taste and texture, yummy cheese, and surprisingly flavorful soy "bacon" bits. Like all of Mary Jane's products, this one is certified organic. The catch? Preparation could be simpler — a skillet is required, and oil is recommended (provide your own). 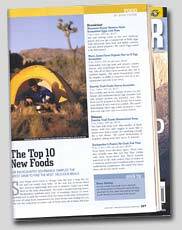 The remainder of this article can be found on pages 127-129 of Backpacker Magazine, June 2003.